Can I remediate my contaminated land in-situ? In-situ treatment technologies have been improving and expanding rapidly over recent years. Technologies are now available for the in-situ remediation of a wide range of contaminants in soil and groundwater. Hopefully there is one (or many) which can be used to treat your site. You are going to have to ask an expert if your contamination can be treated as there is too much variability in contaminants and site scenrios to be able to explain here. A general guide is that organic contaminants (fuels, solvents, etc) are usually treatable in-situ, while most inorganic contaminants (metals etc) are not. If the contaminated materials can be accessed with an excavator or a drilling rig, then it is possible to apply an in-situ treatment, assuming that an appropriate treatment is available. I have always assumed that contamination must be accessible with a drill rig, otherwise you wouldn’t know that the contamination was there. 1. The avoidance of mass excavation works which are often expensive and high risk for health & safety aspects. 2. The potential for the treatment of typically inaccessible materials e.g. at significant depth and/or beneath physical structures. 3. The re-use of previously contaminated materials on site, which can be great for both the environment and for the all important bottom line (e.g. savings compared to dispsoal and re-instatement costs). Admitedly this applies for most on-site treatments, both in-situ and ex-situ. 4. The safety of keeping contaminated materials below ground level, therefore avoiding bringing them to the surface where there would be a significantly increased risk of contamination spreading. Click here to read about a recent in-situ remediation project which involved the combined in-situ chemical oxidation & stabilisation of contaminated soil and groundwater. As always if you have any questions please do not hesitate to contact us on e-mail or phone – 0800 0209 307. Great post, I’ve been trying to find out a little bit more about in-situ remediation recently, so this has really helped. Interesting that one of the benefits is actually to keep the contaminated materials below ground. 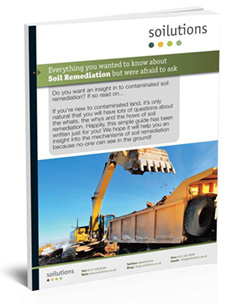 Great post, Remediation of contaminated lands can done with the help of experts in remediation. There are a lot of experienced remediation contractors now available in the country. In situ remediation techniques have seen a boom over the last few years. Being a reliable environmental remediation technique, in-situ method along with ex-situ soil remediation technique have helped cleanup contaminated soil and firing ranges across the terrain.